If you've been looking for a new way to preserve your memories outside the boundaries of a traditional scrapbook, creating art journals may be the perfect solution to your troubles. Journal Revolution: Rise Up and Create! 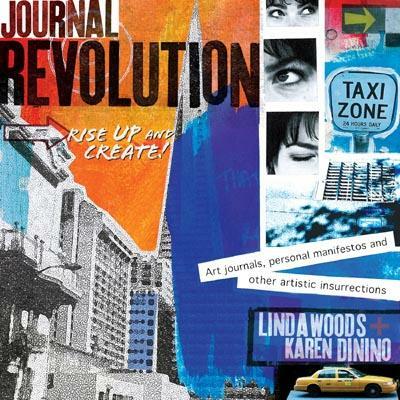 In the recently released Journal Revolution: Rise Up and Create!, sisters Linda Woods and Karen Dinino encourage their readers to combine visual arts and the written word to create art journals that explore life in all its glory. While scrapbooks tend to focus on the "pretty" aspects of our daily existence, Woods and Dinino believe that art journals reveal the noise, clutter, and raw emotion that define our humanity. Projects covered in Journal Revolution include personalized CD covers, journaled daily calendars, faux Polaroid pictures, and artist trading cards. Experienced scrapbookers will find art journals to be an extremely therapeutic form of creative expression. Instead of using pre-designed stickers and papers to create your layouts, you'll be cutting, tearing, pasting, painting, distressing, stenciling, and stamping each one-of-a-kind journal entry. Instead of adding yet another Christmas layout to your album, you'll be exploring your hopes, dreams, fears, and innermost thoughts in pages that may or may not be shared with your friends and family. Art journals are also useful in that they encourage you to let go of the feeling that everything about a project must be "perfect" for it to be successful. "Revolutions change conventional thought, and this one is no different," Woods and Dinino write. "Conventional wisdom is that you do not paint on a photo. You do not tear pictures. You do not have crooked lines, and if your paint drips-YIKES!-you start all over. Ahh, but in our ever-spinning world, we do have crooked lines, torn images, drips her and there, shatters. Our journals must be a safe place to depict this world." Before writing Journal Revolution, Woods and Dinino released Visual Chronicles: The No-Fear Guide to Creating Art Journals, Creative Manifestos and Altered Books. 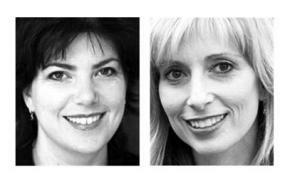 The sisters also teach workshops across the country to help writers learn to communicate better with art and help artists communicate better through words. Their unique approach to art journaling has been featured on The View and in magazines and newspapers nationwide. Recently, Linda Woods took the time to answer a few questions about creating art journals for the readers of LoveToKnow Scrapbooking. How did you first become interested in creating art journals? We've kept journals for as long as we can remember. We'd work on them together, Karen would do the writing and I'd do the art and then we'd swap duties. Where do you get the ideas for your projects? We are inspired by LIFE! I get ideas from things I see, taste, hear, and feel. I am always mindful of my surroundings and the colors and textures of everyday things. I never run out of ideas because life is what fills my pages, from simple moments in my day to wishes and big events. It all goes in the journal! If I feel it or think it, it becomes art. How does an art journal compare to a traditional scrapbook? Art journaling is really about self expression without rules or boundaries. It's something you do for yourself and no one else. Traditional scrapbooking is about preserving memories and telling stories for other people to enjoy. Why would a scrapbooker be interested in making an art journal? I think everyone would be interested in making an art journal, whether or not they are a scrapbooker. Art journaling and scrapbooking are really two very different arts that can co-exist with great rewards. Scrapbookers want to express themselves, too! Scrapbookers can combine art journaling and scrapping to create very unique and personal pages. Scrappers can make color copies of their art journal pages and incorporate them into their scrapbook layouts to add a bit of themselves to their pages. What's the best way to start an art journal if you don't think you're creative enough to make collaged art? Everyone is creative enough to create an art journal page! An art journal can be created with anything. It can be words and photos or drawings or torn pages from a magazine...you are the boss of your own journal. Start by writing stuff down and seeing what colors and textures come to mind. Don't get bogged down by finding the perfect supplies. If all you have is tape and an old magazine, start tearing out pages and tape them to paper. Add clipped text or your own handwriting. The great thing about collage is you need no skill at all. Don't let the fear of perfection stop you. There is no perfect art. What matters is expressing yourself in all the ways you can! There are no rules! Your art journal is your best friend, your confidant, your safe place to say whatever you want. There's no wrong way to create art! Purchase Journal Revolution from Amazon.com. Visit the Journal Revolution blog. ~A review copy of Journal Revolution was provided by the publisher for this article.